Last week, the 54,000-ton cargo ship RHL Fidelitas arrived to the port of Odessa in Ukraine. Everything looked good as the Liberian-flagged ship approached port until the main engine failed. Without power to reverse the propellers, the inevitable happened. The ship's inexorable inertia kept moving it towards one of the port's docks. 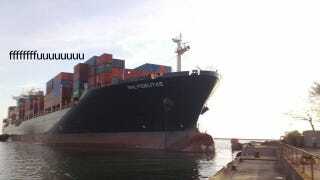 A pilot ship tried to stop it, but it couldn't deal with the massive ship's speed. Not only did the Fidelitas crash against the dock, destroying part of it, but it also crushed and sank the pilot ship.